BONUS: Click here if you'd like to see the static/non "animated" version of this picture. Max Dillon was working on power lines (lookin' in the sun for another overload) when he was struck by lightning and given the power to conduct and control electricity). It's a little known fact that the same thing happened to Benjamin Franklin after the kite and key incident. He took to using his electrical powers to punish those who had voted against the turkey as the national bird and to terrorize French prostitutes (or something like that. I'm more up on my comic book villains than American history). Also in today's picture is Peter Parker's dear old Aunt May. 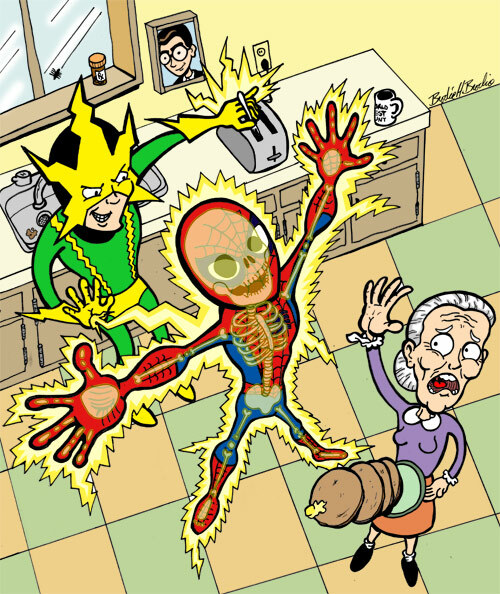 I'm not exactly sure what brought Electro to Aunt May's kitchen in the first place. I think maybe he was casing one of the neighbor's houses and then was drawn there by the inviting aroma of wheatcakes. What are wheatcakes, you ask? They appear to be what you and I and everyone else call "pancakes" (occasionally "griddle cakes" or sporadically "flapjacks"), but what Aunt May calls "wheatcakes." Perhaps they have a higher wheat content. I don't know, Aunt May won't give me the recipe. Anyway, she's dropping them now, so it looks like there won't be wheatcakes for anybody. Thanks a lot, Electro. When he's not playing supervillain, Electro also has a career in movies, having starred in films such as "The Flamingo Kid," "Rumble Fish" and "There's Something About Mary (Jane Watson)." TOMORROW: Near the lair of The Lizard! Awesome blog post nice quality . Best VPN good VPN provider will offer servers in a large range of different countries.